Over the past two years, Albright Church has had the opportunity to partner with SOAR Heartland to see youth from our congregation have the opportunity to grow in their understanding what it means to live on mission with Jesus. SOAR Heartland is a 10-day discipleship training and mission program that runs over the course of spring break. Youth teams from across the prairies join together in Winnipeg to worship, learn, eat, and dorm together. They also have the opportunity to practice what they are being taught as they partner with various organizations who are serving the needs of the vulnerable in Winnipeg. We celebrate the growth that we have seen in the lives of youth at Albright and greatly appreciate the work that the SOAR team does to create an atmosphere of disciple making and mission engagement for youth all across our city! 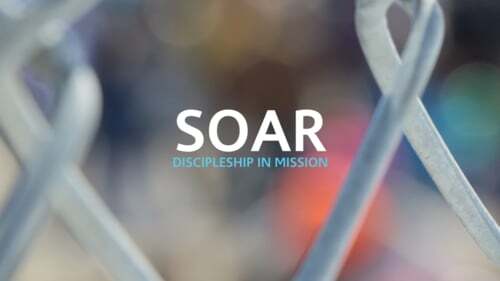 This year, our neighbour, Eastview Community Church is hosting SOAR at their facility and although we were unable to commit to sending a team of our youth, we have the awesome opportunity to partner with SOAR in a new way. Albright Church will be the sleeping site for the SOAR leadership team from March 21-30. We are grateful that God has made a way for us to continue to support the ongoing efforts of SOAR and to work together as the greater body of Christ together with our brothers and sisters at Eastview! If you happen to see any of the SOAR Leadership team here at Albright at the end of this week or next, be sure to give them a high-five and a word of encouragement! SOAR is also looking for volunteers to help out at Eastview with Breakfast Prep, Breakfast Cleanup, Lunch Prep, Lunch Cleanup, Supper Prep, Supper Cleanup and Facility Cleaning. This is another way we can practically come along side to help our youth grow in their walk with Jesus. No role is too small! We all can participate in what God is doing in our city as He gives us eyes to see the opportunity! Even if you are unable to serve in a hands on way, we encourage you to bring SOAR Heartland before God in prayer. Ask for the movement of His Spirit in the lives of young people to transform, to encourage, and to strengthen. Seek God's strengthening for the SOAR leadership team and pray that God would move in a mighty way to lead the next generation of Jesus followers!